Taco Bell Chihuahua - Gidget the Dog says "Yo quiero Taco Bell!" Well, folks. It turns out that the 2009 Summer of Death is not slowing down. 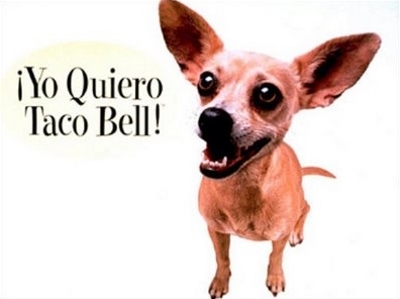 Gidget, the Chihuahua dog from the late-1990’s Taco Bell ad campaign Yo quiero Taco Bell, has died from a stroke at the age of 15. Obviously, this is a sad day for everyone. Famous for saying “Yo quiero Taco Bell!” and “Hey, Leezard!” – Gidget made everyone happy, and she will be missed. Maybe it was a conspiracy. I mean, one day she’s fine, and the next day she’s dead. Sounds fishy to me. Maybe Taco Bueno or Taco Cabana is responsible for Gidget’s death. Just kidding! But I’m sure there are some conspiracy theorists out there who might think that foul play was involved here. In all seriousness, Gidget was 15-years-old and she was sleeping most of the day. That’s old for a dog. She had a great life and put smiles on everyone’s faces. We’ll miss her. In my opinion, this ad campaign was one of the best marketing campaigns in my lifetime. RIP, Gidget the Chihuahua.